A collection of recipes our Guild has researched and developed for banquets, from four different periods of Spanish cuisine, 13th to 17th century. 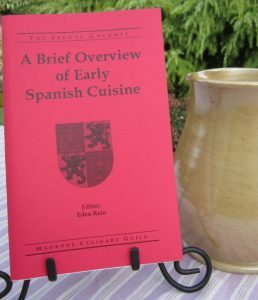 The pamphlet includes a discussion of Spanish cuisine in general. Among 20 tasty recipes are Toledo Cheese Pies and Fried Asparagus.